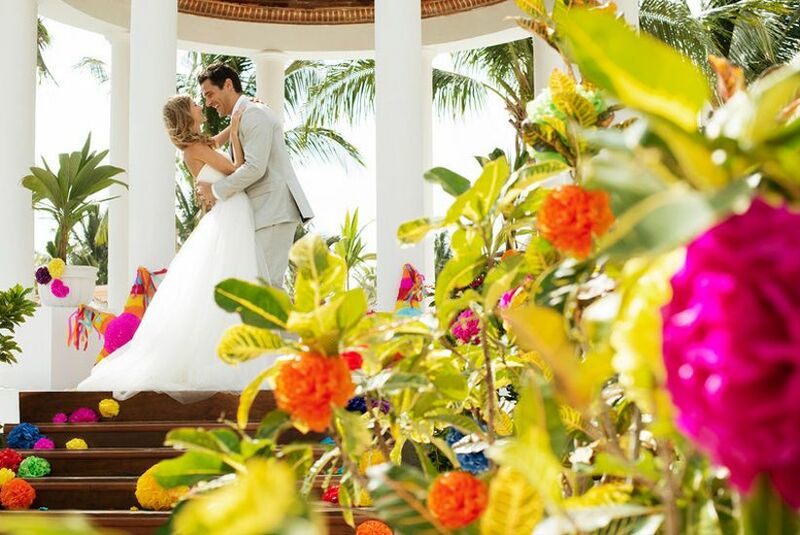 Start planning your gorgeous destination wedding in scenic Riviera Maya with the help of this handy guide. When it comes to curb appeal, this region of Mexico’s Caribbean coastline ranks the highest. Located on the northeastern Yucatan Peninsula, neighboring Cancun and a short drive from Tulum, you’ll find glamour, serenity and of course, romance sprinkled on every shore. For lovebirds fleeing their hometowns in search of vitamin D to match their rose-colored shades, a Riviera Maya wedding will check off all of their boxes. Here you can find may all-inclusive, luxury resorts and many smaller towns like Mayakoba or Playa Del Carmen. 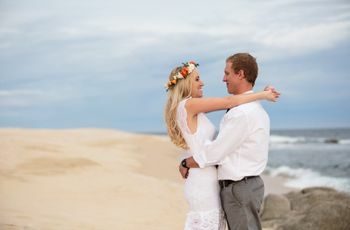 This makes for a variety of options, scenery and experiences that make your destination nuptials that much more memorable. If you’re considering hosting a Riviera Maya wedding, here’s what you need to know before sending out those save-the-dates. Mexico’s weather is pretty tough to beat—even if you’ve laid on some of the most beautiful beaches in the world. Though it spans the Atlantic, the Caribbean and the Pacific, for a Riviera Maya wedding, there are certain seasonal shifts to be mindful of. While the dry season between December and April is the most popular (hello snowbirds and spring breakers! ), July through September feature off-season priceless and a bit more rainfall. Try your best to steer clear of October and November, since that’s when the threat of hurricanes is the most prominent. When you decide to send your guests packing out of the country for your big day, it’s important to remember it isn’t merely a vacation, but a binding, legal ceremony. This means while your maid of honor only needs her passport, you and your beloved need a bit more paperwork to get hitched. 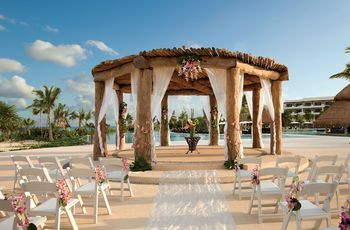 For your Riviera Maya wedding, talk to a professional who can guide you through the process, since every state of Mexico has various requirements for out-of-country newlyweds. You might need everything from a birth certificate to a divorce/death certificate, and in some cases, a blood test. From gorgeous beaches to idyllic cabanas and gazebos, here’s where to have that Riviera Maya wedding you’ve been dreaming of. Did you know there is a large eco park less than thirty minutes from the Cancun Airport that offers the opportunity to see flamingos, many bird species and float through a magical underground river? We didn’t either—until we discovered this Riviera Maya wedding venue. A short walk or boat ride away from the infamous Xcaret Park, the all-inclusive Occidental Grand Xcaret Resort makes you feel like you and your guests are part of the jungle. You’ll see parrots hanging out in the main lobby, spider monkeys scaling the palms above your head, and a coatis (Mexican raccoons) may cross your path. 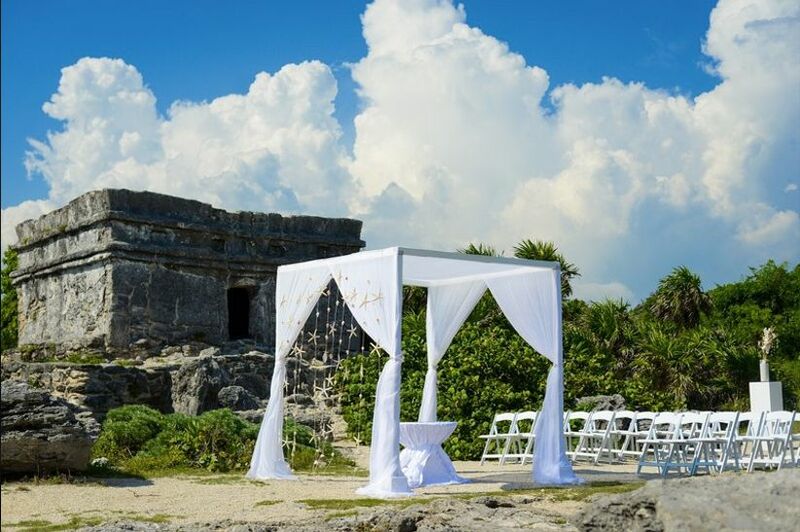 Couples here can wed at sunset by genuine Mayan ruins located on the property, complete with cliff-side ocean views and some of the clearest water in the state. It’s recommended to upgrade to the Royal Luxury experience, as it sets the bar high on service and care. Regardless of where your guests stay though, the onsite wedding coordinator ensures no rock is left unturned and your wishes come true. 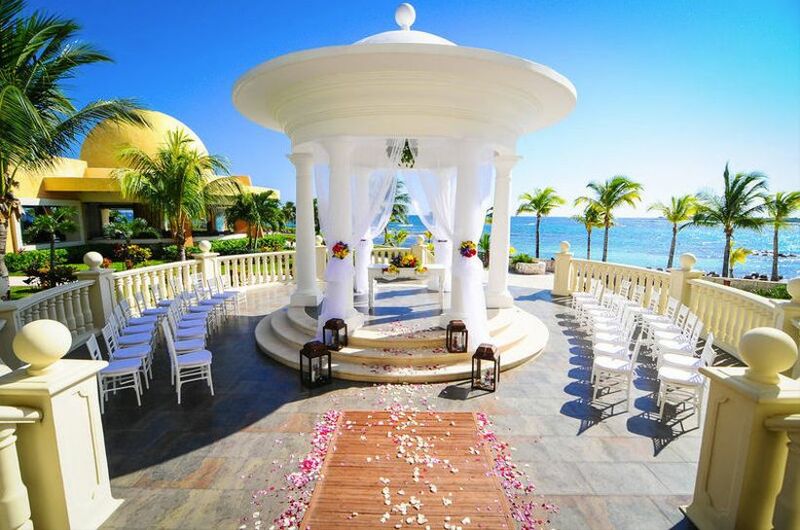 Sugar-white sand, Mediterranean-style touches and a sophisticated elegance, your Riviera Maya wedding can have it all. The all-inclusive Excellence Riviera Cancun doesn’t just include food and drinks, but luxury touches too, considering they only offer suites. For couples who want privacy, you’ll find seclusion and peace at this adults-only venue complete with six pools and countless amenities. Before or after your big day, make sure to stop by the Miile Spa for a wind-down. Every twosome connects differently. Whether you share the same taste in cuisine or prefer to travel frequently and far, whatever attracted you to one another should be part of your Rivera Maya wedding. If dancing and tunes is your centerpiece, Hard Rock gets it right: offering extended hours to dance the night away to whatever is music to your ears. 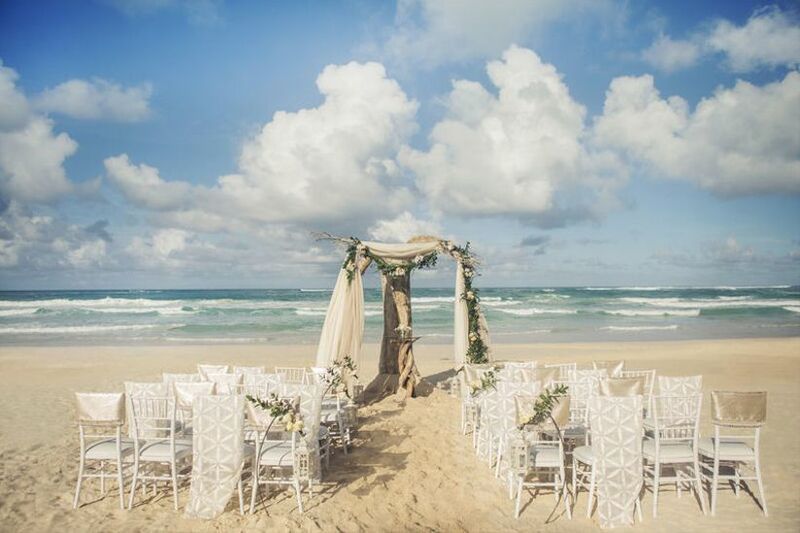 You can say ‘I do’ on the beach for a quick ceremony before heading in for the party, with all your loved ones in tow. 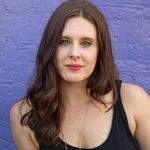 Just chat with their onsite coordinators who will ensure it all happens stress and fancy-free! This isn’t just one resort… but two! And it doesn’t just have to host your wedding, but your honeymoon, as well. 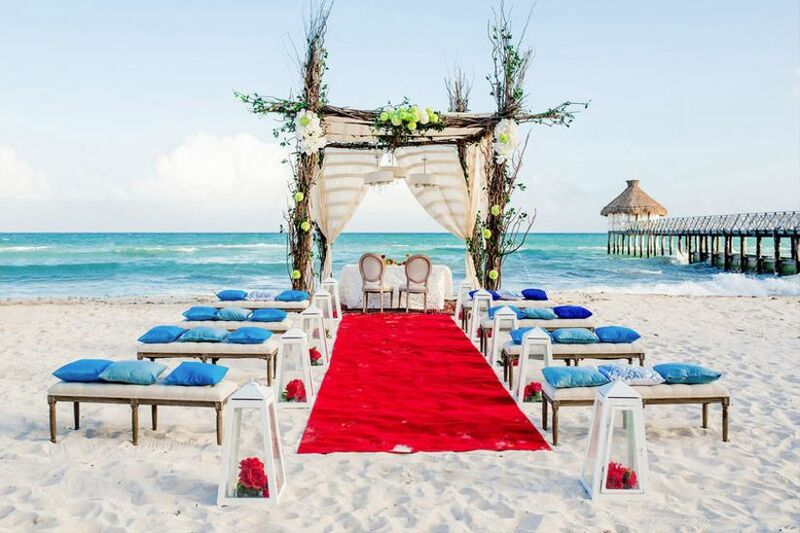 Consider this the most multi-tasking Riviera Maya wedding venue ever. Offering a wide selection of room types at various price points, this adults-only all-inclusive property allows you to cater to every crowd for your big day. You can decide to wed on the beach or inside their chapel, and keep your celebration going on the sand or within one of their restaurants. Once you’ve become a married duo and your guests have left, stay a night (or three) at their overwater bungalows. As the only property in Mexico to offer this experience, you’ll feel like you’re in Fiji… without the price tag! Sprawling five hotels on one of the most captivating beaches in the Mexican Caribbean, you truly can have it all at Barcelo Maya. 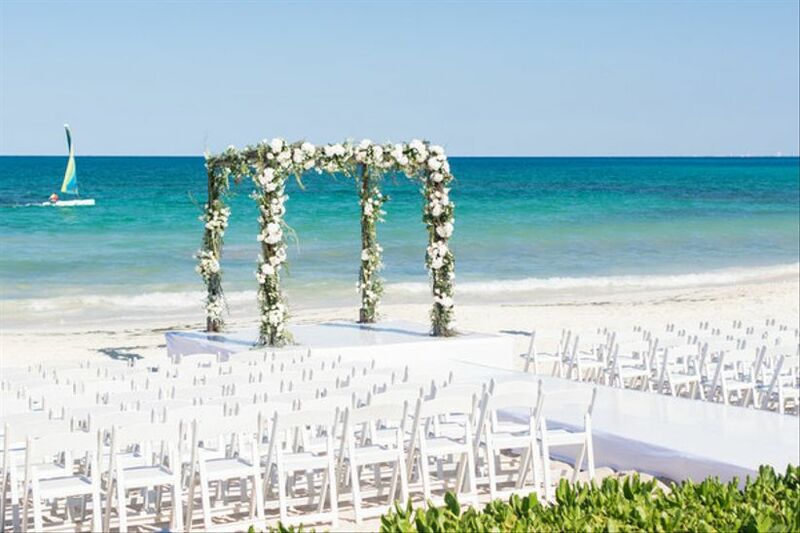 For your Riviera Maya wedding, you get your pick of 2-KM long beaches, gorgeous, tropical walkways, impressive ballrooms and countless other venue options. If your guests all fall into different budget categories, this spot is ideal, since it can cater to most—from singles to families and the elderly. Inside, you’ll find a Maya Mall, water sports, night clubs and plenty of other features. Let their onsite team put together what works best for you—and you can spend more time celebrating your love. If you’re a bit more of an adventurous and curious couple, consider Desire Pearl for your Riviera Maya wedding. As a clothing-optional resort, the venue is definitely out of the ordinary, but ideal for curious twosomes who seek an intimate experience—in more ways than one. 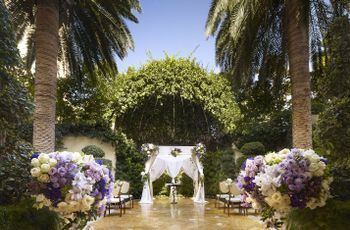 Here, you can wed at the beach, by the pool or anywhere that makes sense for your celebration. 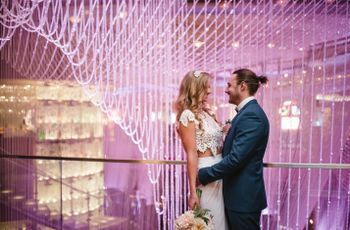 Though weddings here to be smaller, you’ll find the hidden location, the privacy and the experience to be memorable—and well, fascinating.